Less is more. Do less in your relationship and you’ll see your partner step up to the plate. There’s a difference between positive attention and negative attention. It’s something you’ll want to watch out for while Venus is in Aries. Cast a wide net and say “yes” to any offer or opportunity that comes your way today. You can always sort out the duds later. You’ve got a lot of things on the line right now which means that you’re probably looking for the nearest exit. Keep on doing what you’re doing because you’re on the verge of a breakthrough! Take a setback in stride. Not only are humbling experiences good for the ego, but they also reinvigorate your fire and drive. Maybe you’re manipulative but it’s in service to a higher cause. Your motives are sincere. It’s why you don’t feel the need to explain them to those whose motives aren’t. Venus in Aries makes friends eye you with suspicion. It sounds unbelievable, but be ready for it. Forewarned is forearmed. It’s good to travel over unfamiliar ground. Nobody ever grows by staying inside their comfort zone. Challenges push you to stretch. You may feel like tossing your superior an anchor rather than a life preserver, but you were born under Jupiter, planet of moral values. You can’t help but do the right thing. It’s a good time to pare down and offload. 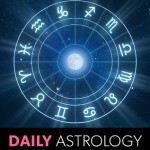 Today’s Sun/Saturn trine helps you identify what to keep and what to toss. Getting what you want may mean losing someone in the process. If so, then this person was never really in your corner to begin with. When the going gets tough the tough get creative. Today’s Sun/Saturn trine tests your mettle and your ingenuity.